The point furthest from the center of the Earth: The crater of Cotopaxi! Why? "Because it's there!" Because it's there? As a reason to do something, this seems almost as implausable as what it was describing -- somehow something was missing. How could 18 hours of arduous hiking with a heavy pack and scarce provisions be explained in three words? We were determined to find out. After a week of preparation, we arrived in Banos on Friday evening, just in time for the big "Whoomph" which signaled a city "sin luz". But, that didn't matter. It was time for a snack and sleep. The next morning, we got up around 8am. Everyone was ready. I had to wait for some guide friends, so I stayed behind. Unfortunately, the hostal manager mistook the others for me, and sent my friends along. I was alone. I tried to hire a truck for the first leg, as the others did, but it was too expensive for me to pay all by myself. Fortunately, in the hostal were some others who had recently climbed Tungurahua, and I asked them about the route. They said that walking the whole way was possible, and told me how to go. I grabbed my bags, and started walking. The trail was steep, but very interesting and alive. A few hours into it, I began to see some hens and horses. I had reached the village of Pondoa. Not much of a village, with about a dozen houses and one store. I wondered what it would be like being a kid here, how would you make friends? Anyone who wanted to visit would have to climb up the side of a mountain! About an hour past Pondoa was the park entrance. By the time I got there, I had already seen 14 different kinds of butterflies, amazing flowers and plants, giant beetles, and billy goats! At the park entrance, my guide friends greeted me with a smile. I sat for a few minutes, paid my entrance fee, and we were off. We were already 1000 meeters above Banos, and a little tired. We continued along at a reasonable pace, with frequent short breaks due to my cramping legs, his blisters, our thirst... Shortly before the sun fell, we spotted the first pole. The main refuge had been recently renovated, and one of the "improvements" was electricity. And, so we had beautiful power lines and their respective poles marring the scenery. Improvement, or scar, we didn't care, on the pole was painted the number seven, meaning we had only six more to go. We kept on, through the darkness, and finally arrived at the hut. Tori greeted us with a bowl of spaghetti, as Tom fixed some soup. We unloaded our gear and unwound. Talk about taking a load off! The plan was to wake up at 1am, and leave around 2 with the other groups. Just after midnight, people began to stir. We cooked some oatmeal, arranged our gear, and got ready to leave. It had recently rained, and was dark. 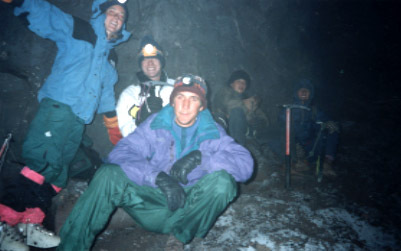 At around 2:30 we fired up our headlamps, grabbed our ice axes, and were off. To our right we could see the lights of Riobamba, and behind us, Banos. Behind Banos, we could see the eerie glow of the snow peak of Cotopaxi. The Southern Cross was straight ahead. When it wasn't obscured by clouds, we had a full moon to light our path. As the sun slowly began to warm the sky to the left, and the moon shone on our right, Venus "the morning star" appeared ahead of us. 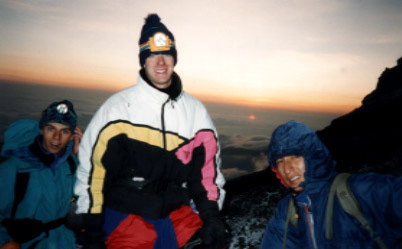 The sun rose above the wisps of clouds and on our right we could see the immense giant, Chimborazo. As the ground began to change to a loose, rocky terrrain, lightly dusted with last nights snow, we passed the earlier group. We were glad to have our ice picks, and used them as a third leg. We slid up and down, and finally reached some firm rocks. We were at the beginning of the crater! We were cold, tired, and hungry. Some of us wanted to stop. Now. Immediately. To eat, to rest, to refuel. But we held on, preserveering only because we knew that less than twenty minutes ahead lie hot steam vents, where we could not only eat and rest, but also warm up! Tori, Ivan, and Christian relax in the Steam Vents! Finally, we were there. We unloaded our packs, ate some snacks, and drank some ice cold slushy water. Ahead we could see the small glacier, and the peak! We began again, revitalized. 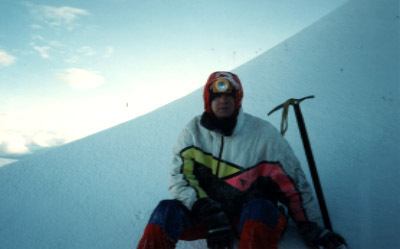 We walked to the edge of the crater, and strapped on our crampons. We scurried up the glacier, climbed over a small ridge, and stood at the pinacle. Victory high-fives all around, we were THERE! We made it -- 5016 meters high, 3200 meters above the tiny town of Banos. We could see all of Ecuador; we could see the edge of the world! 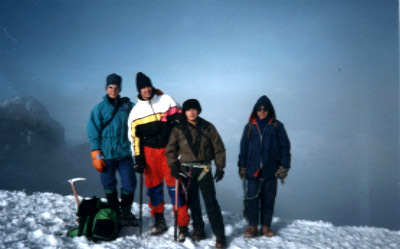 Tom, Ivan, guide Henry, and his friend at the Summit of Tungurahua! Congratulations to Christian, Tori, and Tom!